So that special day is coming up for that Spanish speaker you love, and you’re not quite sure of the best way to wish them a special day? Or is it that you will need to navigate having your birthday in a Spanish-speaking environment for the first time this year? Never fear, Clozemaster is here to help! 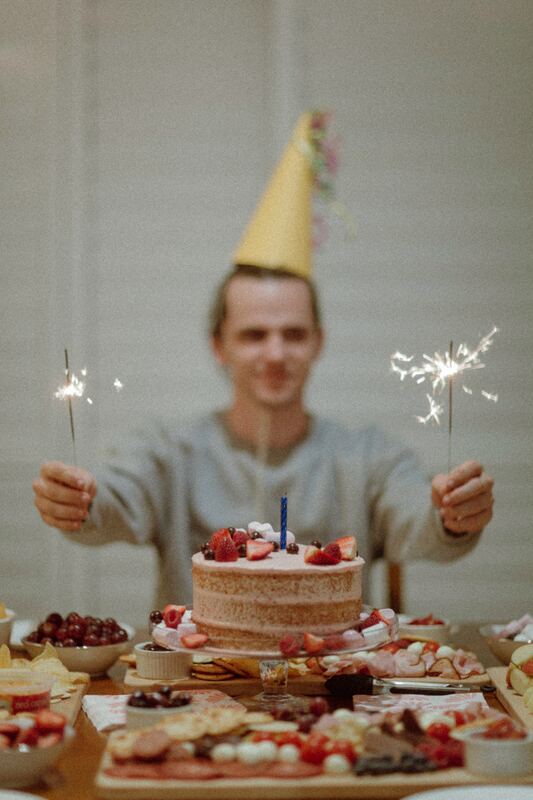 Here you will find all the ways to say “happy brthday” in Spanish, what else you can say to make someone’s birthday extra special, and what to expect from native Spanish speakers when it’s your birthday! Feliz cumpleaños – this is the literal translation of “happy birthday” in Spanish. 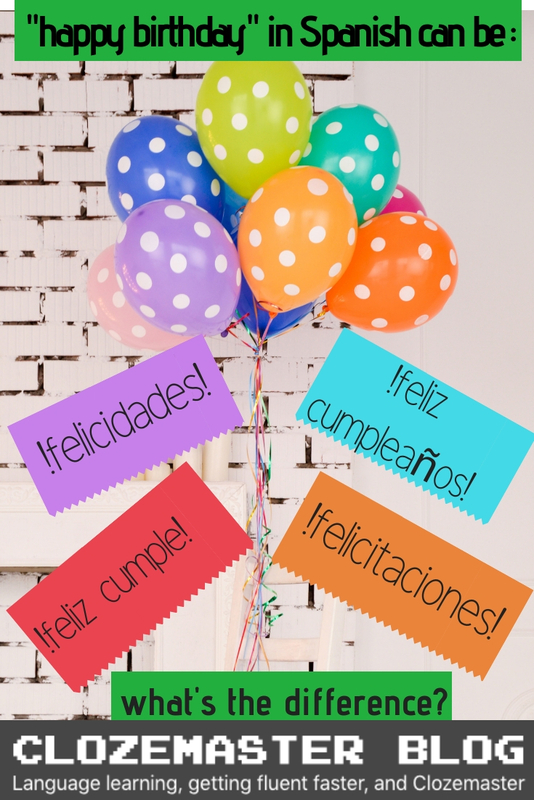 Feliz cumple – cumple is a more colloquial way of saying birthday and is widely used in the Spanish-speaking world. So if you’re aiming to say “happy birthday” in Spanish in a more informal and friendly way, feel free to use this instead. Felicidades – felicidades literally means congratulations, but is widely used as a substitute for “feliz cumpleaños”. It is a more emphatic and emotional way to say “happy birthday” in Spanish. Felicitaciones – this can be translated as greetings, but also congratulations, like felicidades. However, this is slightly more nuanced and formal, so it is less commonly heard than the other three greetings. The most common way to wish someone a happy birthday in Spanish is felicidades. The world cumpleaños is a compound word in Spanish, just as is the English word birthday. However, when we break them down in the most literal sense, the two words are not the same. The Spanish word cumpleaños is made up of the words cumple and años. Cumple is a form of the verb cumplir, for which the closest English translation is to turn as in, “I’m turning 24 this year”. Años means years. So literally, we have “turns years”. Doesn’t sound great in English, but in Spanish it makes perfect sense. So, cumpleaños has a very commonly used verb form: cumplir años. Cumplir can be treated as a regular -ir verb, and conjugated as necessary. This is a very diverse expression and can be translated in a variety of ways. Cumplir años is also often used where we would use the English “birthday” as a noun. Note that the noun cumpleaños could also be used in these sentences if you wanted a more literal translation of the English, but using cumplir años is just as common. You can also add the age in between cumplir and años to express the meaning “turn X age”. In more informal Spanish, you can drop the años. Spanish speakers are generally very fond of expressing as much love and happiness with their language as they can. 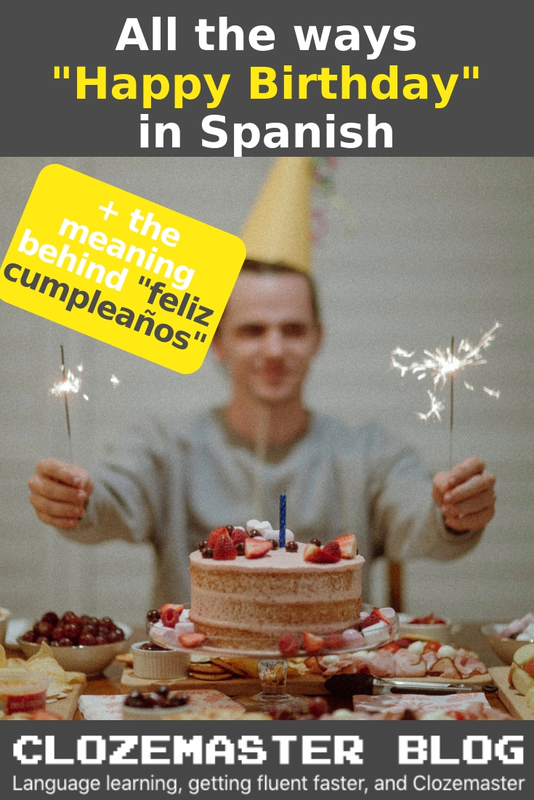 So along with saying “happy birthday”, it is very, very common in Spanish to add some well wishes or special messages to show how much you really do wish the person to have a happy birthday. You might notice that absolutely all of the well wishes below are formed using the present subjunctive tense. Check out this guide to Spanish subjunctive from Spanish Obsessed if you’d like to learn more about what this means. Essentially, these expressions show one of the main uses of the subjunctive, which is to express desire (deseo) or hope (esperanza). As you can see, the general formula for these birthday expressions is que (that) + subjunctive verb + predicate. As this structure isn’t used in English, these expressions might be a bit confusing to you. A simple way to think of them is as if this que is equivalent of the English “may”, which, in this context, it is. The idea is that giver of the well-wishing is unspecified. If it’s still confusing to you, you could also add espero (I hope) before the que which would give essentially the same meaning, but then there is more emphasis on the giver of the message. In any case, for those phrases below which might be a bit harder to decipher, I have added a literal translation under the meaning. Meaning: Have a good birthday! Literal translation: May you spend it well! Meaning: Have a special day! Meaning: Hope your dreams come true! Literal translation: May you realise your dreams! Meaning: Hope you have many more birthdays! Literal translation: May you turn many more! Maybe you’ve got someone extra special in mind and you really want to send them a beautiful, heartfelt birthday message in Spanish. But you don’t trust your ability to sound sweet and articulate in Spanish. Here’s a cool website where you can find a bunch of different birthday messages. You can be sure the message will be appropriate because they are categorized according to your relationship to the person! Is it you who will be the birthday boy or girl and you want to know how to deal in the Spanish-speaking world around this time of year? In response to “happy birthday” in Spanish, a simple “gracias” will usually suffice. You might be asked some other questions around the time of your birthday, so here’s how to deal with those conversations. ¿Cuántos años vas a cumplir? Meaning: How old are you turning? Meaning: When is your birthday? Meaning: What do you want for your birthday? ¿Qué vas a hacer para/en tu cumpleaños? Meaning: What are you going to do for/on your birthday? When it comes to birthdays, the culture in Spanish-speaking countries is quite similar to English-speaking countries. By this I mean parties, cake and presents are all commonplace. In saying that, there are some regional traditions which vary country by country. In Latin American countries, girls have a big birthday party and celebration when they turn 15 – it is sort of traditionally regarded as becoming a woman. This party is known as the quinciañera. For guys, the bigger celebration happens at the age of 18. The Spanish-speaking world is so diverse and vibrant that there is no one universal “happy birthday” song in Spanish. Instead, most countries have different variations of the song. At least they all seem to follow the same “happy birthday” tune we know and love – so if in doubt, you can just hum along! In saying that (just to make things even more complicated), a lot of countries have their own traditional song as well as the more well-known tune. Quick note: Cumpleaños feliz or feliz cumpleaños? Some people get confused and think the correct way to say “happy birthday” in Spanish is cumpleaños feliz because that’s how it’s sung in the song. In fact, cumpleaños feliz is just a poetic version of the standard feliz cumpleaños. It’s probably been worded the other way around in the song because it fits better into the tune. So in short, you wouldn’t just say cumpleaños feliz to a friend casually. Below is the Spanish “happy birthday” song I am familiar with from spending time with Colombians. Lyrics for most Spanish-speaking nations’ versions for the song can be found here. But for now, read the lyrics of this version and see if you can understand the meaning. The translation is provided to the right. Sign up here to save your progress and start getting fluent with thousands of Spanish sentences at Clozemaster. Clozemaster has been designed to help you learn the language in context by filling in the gaps in authentic sentences. With features such as Grammar Challenges, Cloze-Listening, and Cloze-Reading, the app will let you emphasize all the competencies necessary to become fluent in Spanish. Take your Spanish to the next level. Click here to start practicing with real Spanish sentences!